FOR IMMEDIATE RELEASE –March 9, 2010 – Binghamton , NY – SunMaxx Solar, a leading, vertically integrated manufacturer of solar thermal systems and components, is pleased to announce the installation of a solar thermal system at Rancho Clancy in Rancho Mirage, California. Prestigious Rancho Clancy is a residential, single family property in the heart of Rancho Mirage, California. The custom home is situated on one acre in the Rancho Clancy development. The Solar installation, which was contracted, designed and installed by Michael R. Ditsler of Tiger Electric, Inc., purchased seven SunMaxx Solar Evacuated Tube Collectors for a supplemental pool heating system on the residential estate. 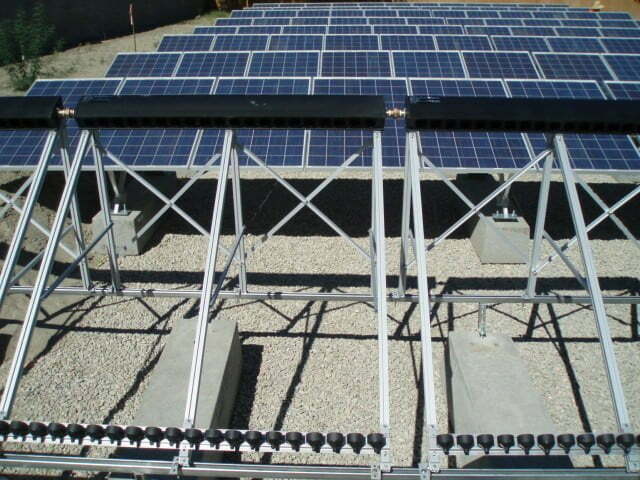 The ballasted Utility Scale PV ground mount racking system holds approximately 64,000 lbs. of pre-cast concrete ballast block. The Solar Thermal Evacuated Tube system, which is the primary heating source for the homeowners’ pool, is piped underground to a cupro nickel heat exchanger located adjacent to the pool filter and pump systems 120LF away from the collector field. High temperature and demand protection is offered though an open system employing a dump back tank and dual taco pumps for supply and return, as the collector field and dump back tank sit 30″ below the level of the heat exchanger. All exposed piping has been insulated with an industrial grade aluminum covered insulation. In conjunction with the 20KW AC PV system, Tiger Electric, Inc. was able to re-size and utilize a retention basin that would have otherwise been unused or wasted space. Control for the primary SEVT System and the secondary natural gas fired pool heating system are prioritized by temperature using a mixing valve. The installation took 10 days total of construction time to finish and a YouTube video of the Solar Installation can be viewed at http://bit.ly/wiyVN2 .